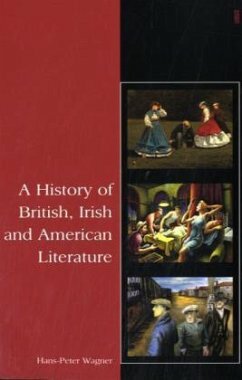 This revised and enlarged edition contains discussions of British, Irish and American literary works up to 2010. Focussing on outstanding writings in prose, poetry, drama and non-fiction, the book covers the time from the Anglo-Saxon period to the 21st century while providing a sense of what is still worth reading. The major innovative feature is the integration of visual material. In addition to more than 160 pictures complementing the text of the book, the CD-ROM attached to each copy contains the entire text and 460 illustrations. This visual aspect as well as the introductory sections on art for each century give the reader an excellent idea of the symbiosis between visual and verbal representations and the undeniable debt of literature to art. Further innovative features include - discussions of non-fictional works from literary criticism and theory, travel writing, historiography, and the social sciences - analyses of such popular genres as crime fiction, science fiction, fantasy, the Western, horror fiction, and children's literature - footnotes explaining technical and historical terms and events - a detailed glossary of literary terms - chronological tables for British/Anglo-Irish and American literatures - an updated (cut-off date 2010) detailed bibliography containing suggestions for further reading - an extensive index covering names and important topics in literary history and criticism as well as terms from cultural history Hans-Peter Wagner is Professor of English and American Literature and Dean of the Faculty of Social and Cultural Sciences at the Landau campus of the Universität Koblenz-Landau. He has taught at German, British, American and African universities and was a Distinguished Visiting Professor at Dartmouth College. The editor of several English novels in the Penguin Classics series, he has published books and articles on colonial American culture, Enlightenment literature and art, postmodern American literature, and more recently, the graphic art of William Hogarth and text-image relations. Hans-Peter Wagner is Professor of English and American Literature and Dean of the Faculty of Social and Cultural Sciences at the Landau campus of the Universität Koblenz-Landau. He has taught at German, British, American and African universities and was a Distinguished Visiting Professor at Dartmouth College. The editor of several English novels in the Penguin Classics series, he has published books and articles on colonial American culture, Enlightenment literature and art, postmodern American literature, and more recently, the graphic art of William Hogarth and text-image relations.